THE ANAHEIM DUCKS lost their sixth straight Monday, losing 2-1 in overtime to Tampa Bay. The slide continues for the Anaheim Ducks, as they lost their sixth straight contest Monday, falling 2-1 to the Tampa Bay Lightning in overtime at Honda Center. 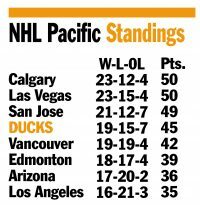 One sole consolation is that the Ducks did pick up a point, and are now 19-15-7, worth 45 points and fourth place in the NHL Pacific Division. Nick Ritchie scored the sole Anaheim goal in the first period to tie the game, which went scoreless through the second and third periods. Thirty-five seconds into overtime Brayden Point scored for Tampa Bay (31-7-2) to win the game for the visitors. The Ducks are next in action on Friday hosting the Las Vegas Golden Knights (23-15-4). The Knights are tied with Calgary for first in the Pacific Division.